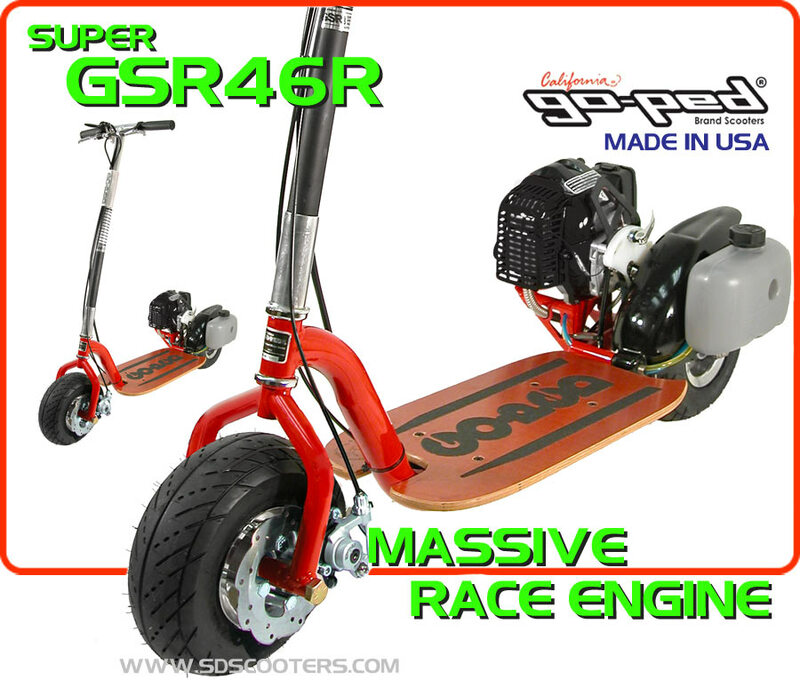 Super GSR46R - The Fastest Production Scooter on the Planet! The GSR46R comes with all the good stuff including a heavy duty 4130 chromoly steel frame - 'bothy" forks - Mach 4 Composite rims - front and rear maddog brakes and the same high output engine as the Trail Ripper which can put out up to an awsome 5.5 horsepower with basic addons! This is the race machine to beat - you will be untouchable when riding the Super GSR46R! Looking for fun and ecomical transportation with a lot of go? The Super Gsr46r is ready for you. With an optional bolt on seat it becomes the perfect commuter** costing pennys per day to operate. Get the optional wagon for those big shopping trips or use the optional seat with basket for quick trips. Powerful and reliable transportation doesn't get any less expensive than this. Over engineered is the Go-ped mantra. They have oversized components throughout, use premium quality components and materials, and boast the highest maximum rider weight. With the highest output engine of any stand up style scooter you will find riding up hills a breeze. Its geared for maximum fun straight out of the box. And in case you feel the need to customize look no further. We have a huge list of all the best upgrade parts available. 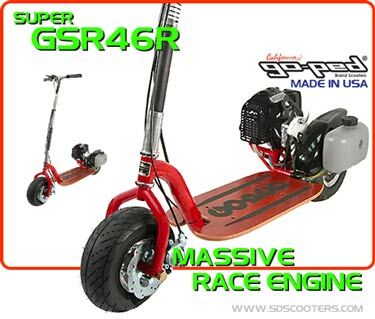 you're going to love the super gsr46r scooter, its powerful engine, super strong frame and ease of maintenance make it a great addition to your family. Here at SDscooters we believe in offering excellent value, real live USA based customer support and the best in optional parts. Scooters, Go-karts, and Pocket bikes are our specialties and offer a complete part list for every model and full tech support. Go ahead and give us a call if you have questions or need a recommendation, our experts are happy to assist. When ordering the GSR46r don't forget to add a seat kit to make your scooter a a great Commuter Scooter that can actually keep up with local street traffic or go for more power and out fit it with a performance exhaust. We offer these options at deep discounts because we want your business.